All Boxed Up and Ready to Go! We all have this love affair with boxed things! Boxed Bakery Cupcakes! Boxed Shoes! Puppies in Boxes. Sparkly surprises in Jewelry Boxes! 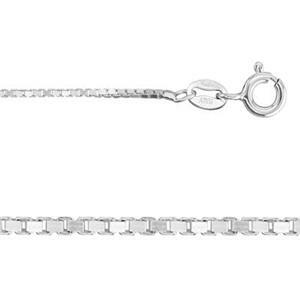 At Halstead, we have the 2BX124 – our Bright, Sterling Silver 1.1mm Box Chain with Spring Ring. 24-Inch Finished – Our Matinee Length. It can be all business and perfectly casual at the same time. Box chain is made from round wire that is rolled flat, then folded into square links that form open “boxes.” It’s a sturdy, finger-smooth chain with a sleek, classy appearance. Add a lightweight Sterling Silver Charm! All “Boxed” up and ready to go for you! Made in Italy, this chain is highly reflective. Four stars out of five since it's not as smooth in the linkage as I'd like.